“I just could not spend another dime, I really wanted a wine that my friends and I could just drink and not talk about!” How often do you feel like this? Far too often I am sure. In my wine world, I taste and evaluate all price points and yes my soul awakens when I can taste and savor a glass of Krug Champagne or ponder over a pour of Château Latour – my pocketbook opens just once when those wines come into my periscope. So how about some wines that we all can afford? Where are the great value wines? The trends have been pointing towards Spain, Argentina and Chile, among other areas in the world. I agree those are the usual places that we should look. That said, when value-hunting, looking in unlikely places can often yield incredible discoveries. I have stumbled across three unlikely places for superb values under $15.00. Let’s take a look at Australia, Italy and the USA. For two decades Australia has been lying in wait to be re-discovered. A star in the 1990’s this multi-faceted viticultural area has been fluttering in space. This was the country that had brought Shiraz (aka: Syrah) to the fore only to become mired in a “cheap” wine mode. Most recently the Aussies have made incredibly fine wines in all price ranges. The 2011 Wild Oats Shiraz drinks exceptionally well. Supported by some subtle sweet tannins for texture, this wine delivers its ripe fruit flavors all the way through its finish. Yes, this is one of the world’s best bargains in fine red wines. When wine drinkers hear of Tuscany, they think of Chianti. As one of the world’s most revered regions, this area has found its sweet spot in the $20 to $40 range, but every once-in-a-while, one can uncover a super bargain and that is just what the 2010 Borgo Scopeto Chianti Classico offers. Decidedly sassy and true-to-the-region, this wine plays nicely into the hands of those that want to save a few $$$’s. One area that one never hears of in the value camp is the USA and how about Oregon, no way! The 2013 Acrobat Pinot Gris is so succulently good. Plenty of ripe fruit and nice acidity, this wine outplays many wines in the $20+ range. While the expensive and exotic marquis wines get all the ink and a few regions in the world have gained the reputation for their “great wine values,” the best values are often found in the most unlikely of places. As a wine retail veteran of 40+ years, I have learn that deals can show up from anywhere in the world. If you are like me (a bargain hunter) let the world be your oyster. Remember the best pearls are often found after the dirt has been washed away. 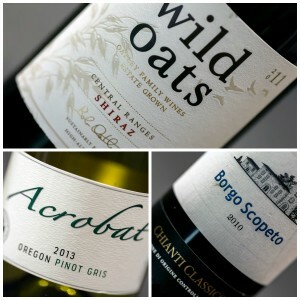 Wine should not be so difficult: A trio of great values!